I have passed this many times on my way to and from work and finally stopped to take a picture. I found it on Vesey street, down by the WTC site. 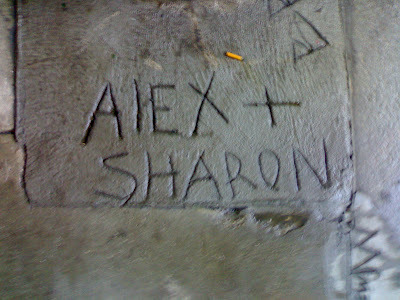 Apparently AlEX + SHARON wanted to profess their love to the world in a permanent way. I apologize for the blurriness. Even if Alex discovered his mistake just an hour later it would have been too late to correct. His carelessness is forever on display, permanently set in stone. This may just be the saddest thing that has ever happened in the site of the former World Trade Center.